It’s time to journey to Middle-earth one last time. 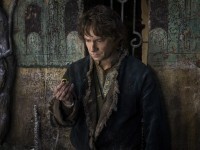 The Hobbit: The Battle of the Five Armies will be out in theaters next week, ending the epic adventure of Bilbo Baggins, played by Martin Freeman, who left the comforts of the Shire to find Erebor with a company of lively dwarves. It’s been a long journey for The Hobbit cast and crew members, many who were involved in the making of The Lord of the Rings nearly 15 years ago. In a video released by Warner Bros., where the cast shared their best memories of Middle Earth, Elijah Wood, 33, recounts how he turned 19 while filming on the Hobbiton location in the original trilogy. “Making [Lord of the Rings] will always be one of the greatest experiences of my life,” he said.